This article covers BDD and Continuous Integration Setup for Xcode 8, and Swift3 using XCFit and xcodebuild. 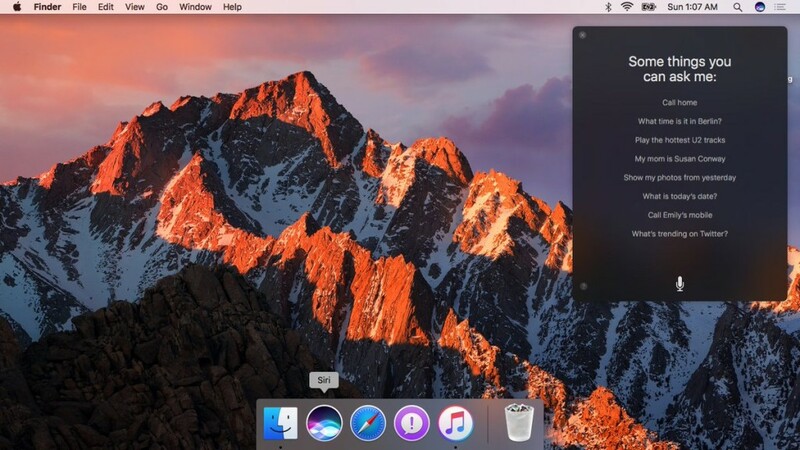 Apple has just released macOS Sierra public beta in the UK and we couldn't wait to see new features of macOS Sierra and Xcode 8. macOS Sierra brings Siri to MacBook Pro with lots of performance improvements but I was keen to try features of the Xcode8 and Swift3 with my recent pet-project XCFit: Full Stack BDD framework for iOS and macOS Apps. I am very impressed with enhancements in the 'xcodebuild'. 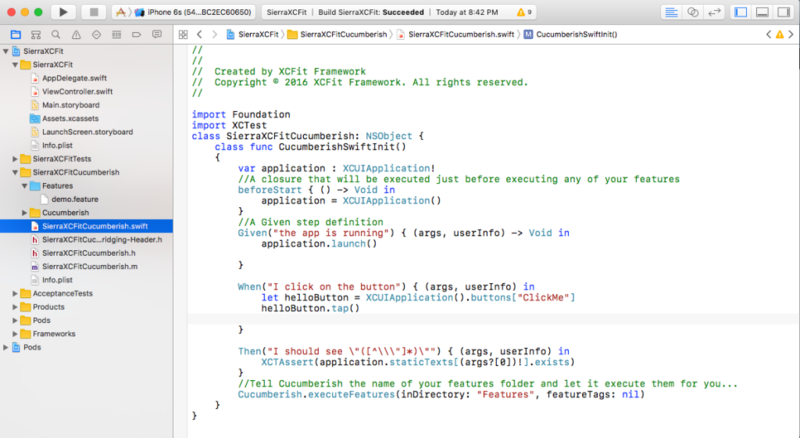 In this post I will step by step guide to setup BDD for iOS10/macOS Sierra project using XCFit, Cucumberish, Xcode 8 and Swift3. XCFit is a full stack BDD framework for the iOS and macOS applications. You can read an article on DZone Mobile to know more about it. It uses Cucumberish and OCSlim to perform Acceptance and UI testing on iOS and macOS application and Apple's XCUI Test Framework to implement steps. It uses Apple’s brand new XCUI Testing framework. Its native Xcode implementation, No Appium, Calabash, etc., etc. You can find the official web page of XCFit on shashikant86.github.io. XCFit allows us to write API, UI and Acceptance Tests with Swift in human readable language using tools like Cucumber and Fitnesse in Xcode. We can still use Apple’s brand new UI Testing framework (XCUI) under the hood of Cucumberish. XCFit is fully automated solution for Cucumberish and Fitnesse. You can use 80(Fitnesse):20(Cucumberish) formula to automate Acceptance and UI Testing for better coverage and faster feedback. XCFit is available on RubyGem and CocoaPods. Add Cucumberish UI tests target and you will have all required Swift and Objective-C files ready. Add 'Testing target' to test your App from General setting of CucumberishTarget. This will generate a preview. You probably need to fix Swift file in the Cucumberish target which Xcode do it for you. Edit Application 'Scheme' to add 'Cucumberish UI Target' to the 'Test' task Or Create separate Scheme as per your need. Now, you need to write your sample feature file in the 'features' directory. Now you are all set to run your first cucumber tests as this step is pre-implemeted by XCFit/Cucumberish. Now we can implement new steps as we go on, we have a lot of steps here. Look at the following implementation and most important brand new Xcode Font SF Mono. 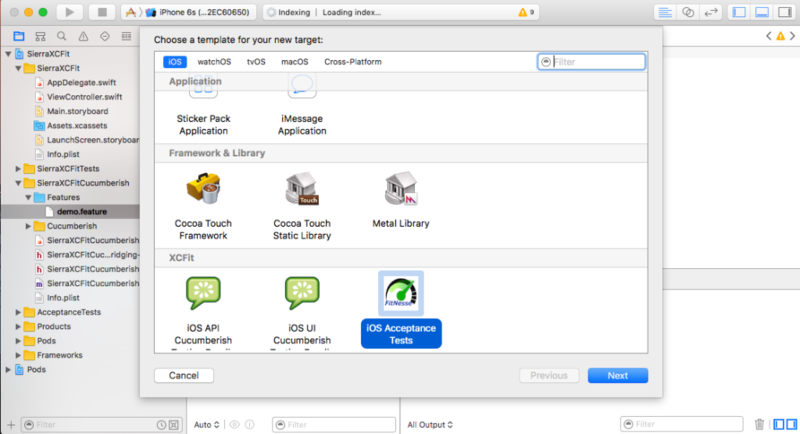 You now use Apple's XCUI Test Framework under the hood of Cucumberish !! Source Code is available on GitHub "XCFit-macOS-Sierra". 'xcodebuild' is the command line tool to build, run and execute our application from command line. This is used in the Xcode server. Xcode 8 now has some improvements in the xcodebuild command line tools. The xcodebuid also has another option called ‘test-without-building’ where we don’t need to provide workspace instead we specify the ‘XCTESTRUN file which will inject that file and runs all the tests. This should run our Unit as well as Cucumberish UI tests. Continuous Integration is an integral part of the software development. Ideally, Cucumberish XCUI Tests should be set on Xcode Server which is Apple's own native CI server but I would wait until public release in autumn. Thankfully, TravisCI has announced support for the Xcode8 last month which allows us to set CI System with Xcode8 project. - echo "==========Now Building for Tests==================="
- echo "==========Now Running Only Cucumberish Tests==================="
We can set it to any CI server which supports Xcode8. You may or may not need to change simulator ID and you will be amazed to see BDD style running in your terminal with Xcode8 and iOS 10. Getting Public release of macOS Sierra! Hope you enjoyed this post about new Xcode8 feature and Cucumberish.